President Bush presented America's highest civilian award on Friday to Pope John Paul II, who has expressed fervent opposition to the war in Iraq and called for a speedy return of the country's sovereignty. The president nodded and smiled as he greeted the 84-year-old pontiff, leaning down to hold his trembling hands. Later, Mr. Bush was to meet with Italian Prime Minister Silvio Berlusconi, a staunch supporter and U.S. ally in the war. Calling the pontiff "a devoted servant of God," Mr. Bush presented him with the Presidential Medal of Freedom. "We appreciate the strong symbol of freedom that you have stood for and we recognize the power of freedom to change societies and to change the world," Mr. Bush said. The president sat stoically as the pope, seated in front of a microphone, read a statement in a voice that was audible, but not easily understood. The hands of the pope, who suffers from Parkinson's disease, shook as he addressed the president and first lady Laura Bush, slowly, often one word at a time. "Mr. President, your visit to Rome takes place at a moment of great concern," the pope said, noting conflict in Iraq, the Middle East and terrorism. The pope said he joined the president in honoring the sacrifices of American soldiers who gave their lives in defense of Europe in World War II. "God bless America," he said in conclusion. The official agenda of Mr. Bush's brief European trip is to honor the sacrifices and triumphs of World War II in Italy and France 60 years ago. But the Iraq war looms large in Italy, where most people think the United States should pull troops out, and Mr. Bush was making his case anew. Thousands of police patrolled the streets of Rome on Friday as small groups of demonstrators marched around the capital, protesting Bush's visit. A large anti-war demonstration was expected to attract thousands later, but a few hundred protesters began early morning marches. A few tossed firecrackers at an Air Force building; others waved rainbow flags that said "No to War" and "Not in my name, Mr. Bush." About 10,000 police have been deployed for the duration of the president's visit, but Mr. Bush saw no protesters as his motorcade rolled toward the Quirinale Palace where he began his day with a visit with Carlo Azeglio Ciampi, who holds the largely ceremonial title of Italian president. Then Mr. Bush met with the pope, where his focus was on efforts to elevate the human condition of the Iraqi people by establishing peace and democracy, CBS News White House Correspondent Mark Knoller reports. He spends the evening bolstering his friendship with Berlusconi, who has deployed about 3,000 troops to help rebuild Iraq. Mr. Bush was accompanied to Rome by Secretary of State Colin Powell, national security adviser Condoleezza Rice and other top administration officials. On Thursday, just hours before Mr. Bush arrived in Italy, several mortar shells were fired at the Italian Embassy in Baghdad, killing at least one Iraqi, the foreign minister in Rome said. Friday marked Mr. Bush's third meeting with the pope since he became president — a measure of the importance both men place on the relationship. The president has aggressively chased Roman Catholic voters since he split the Catholic vote with Al Gore in 2000, and images of the pope greeting him could promote his standing among a group that represents about a quarter of the electorate. More broadly, it reminds Mr. Bush's Christian base that he shares core values with the pope, such as an opposition to abortion. But the meeting with John Paul II also serves as a reminder of the pope's firm opposition to the war in Iraq. Many Italians agree with the pontiff. Last year a million people marched in the streets of Rome to protest plans for the war. A recent poll for the newsweekly L'Espresso found that 54 percent of Italians thought U.S. troops should pull out of Iraq, while 39 percent thought they should stay. Vatican officials recently have issued sharp criticism of the Bush administration's actions leading up to the war and the abuse inflicted by U.S. soldiers on Iraqi prisoners. Last week the pope condemned torture as an intolerable affront to human dignity, lamenting that reports of abuses "constantly arrive from all continents." He made no mention of any countries or specific cases in his speech. The U.S. ambassador to the Vatican, former Republican National Committee Chairman Jim Nicholson, recently sought clarification from the Vatican's foreign minister, Archbishop Giovanni Lajolo, who told an Italian newspaper the prisoner abuse scandal dealt a bigger blow to the United States than the Sept. 11, 2001, attacks. Both sides said they wanted to move beyond their dispute over Iraq in the meeting Friday. The president was eager to talk to the pontiff about religious freedom in China and elsewhere, combating AIDS, and international assistance issues, a senior administration official said Thursday. 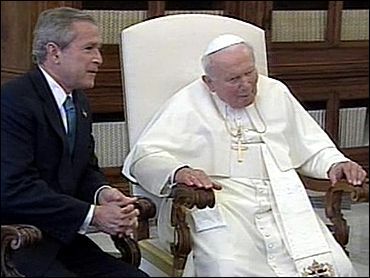 And Mr. Bush wanted to assure the pope that the United States was vigorously investigating the prisoner abuses at Abu Ghraib prison near Baghdad. Also Friday, Mr. Bush and his wife were laying a wreath at Fosse Adeatine, the site of a World War II atrocity in which Nazis occupying Italy killed 335 men and boys, 75 of them Jews. Mr. Bush was spending a second night in Rome on Friday before meeting Saturday for the second time with Berlusconi, then leaving for France. There, Mr. Bush will work to rebuild ties with French President Jacques Chirac, who led the opposition to the war in Iraq. On Sunday the president will head to Normandy on the French coast to help commemorate the 60th anniversary of the Allies' D-Day landing.